After a sterling debut release on Mau5trap, Moguai (Deadmau5´s one to watch´2010) answers the call once again and turns in another outstanding EP in form of Lyve. Pulsing bass, rolling chords, a glitchy pad all add up to give Lyve a truly euphoric atmosphere. Imereal takes things bigger and more hands on the air , dancefloor devastation is almost certain. In the grand circus of music, Moguai is most definitely in the big top. Whilst other acts have come and gone, his star is still shining brightly. Time and again he has set new standards in electronic music, his productions proving timeless in this fast moving business. He is also a highly talented and hugely popular DJ. 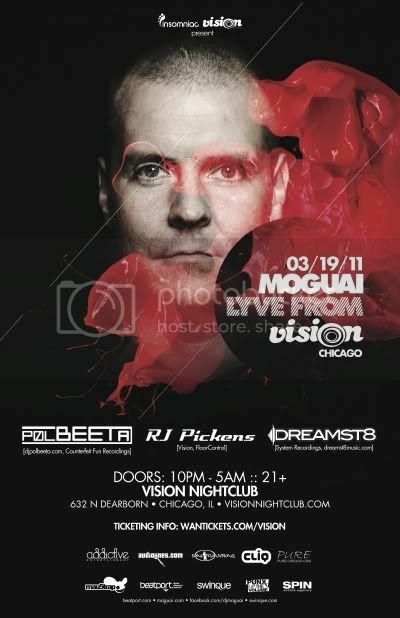 From the deepest underground clubs to the biggest stages of the world, Moguai sets are guaranteed to ignite the crowd. There are few DJs who can move so comfortably between the credible intimacy of a small club gig to the bigger arena. Moguai does so effortlessly, always true to his musical ideals and vision. Music is an incessant process of development for Moguai. His centre of focus is personal taste, without recourse to chasing trends. A marathon of music, not a sprint!